Cattle living in the mountains where there is literally snow melting into streams in August. The summer of 2017 ushered in many new habitat changes in the San Juan Mountains – none more noticeable than a grazing uptick. This was most prevalent in the South San Juan Wilderness near Tobacco and Quartz Lakes – where sizable herds reside. Cattle cause problems in numerous ways and when living in pristine places – the results are disturbing. They damage the ground by widespread trampling while also devouring flowers and grass. Lush green pastures perfect for taking a nap become a cesspool of ants, flies, mud, and loose rock. Flowers don’t automatically grow back yearly and the ground doesn’t magically reform either. It takes decades to fully recover. In areas of competing public use these effects are worse. The herds sleep at obvious camp spots, making those inhabitable – littered with foul manure and swarming insects. This means looking elsewhere and finding new spots – putting more pressure on an over-stressed environment. The same applies for hiking trails. The trails become so disfigured and muddy – hikers have to step off and go around. However, the most significant damage is done to our water supply. High altitude places in the Western US should be known clean water – a vital natural commodity. In the South San Juans, these high-altitude watersheds flow into the Rio Grande River. Tobacco is the highest lake in the wilderness at nearly 12,400 feet. Yet, dozens of cattle graze just beneath the shoreline. I’m all in favor of responsibly herding cattle but not between 8500 – 12,000 feet at beautiful mountain lakes. Can’t we find some place more appropriate? In most towns, chemically treated tap water tastes poor and bottles waste millions of tons of plastic each annually. If our highest and finest natural resources are tainted by bovine – we’ve all got issues. In case you are wondering how much it ranchers pay for their grazing rights – it’s now 1.87 a month for a cattle and calf. That’s down from 2.11 during the Obama Administration. I think they do more damage than that in an hour. Let’s put politics aside and all agree this is not right. If you are interested in more evidence please check out my video uploads here. I’m sure I’ll revisit this topic again in the future. Your thoughts, opinions, and input are always appreciated. Noticeable damage to the banks of lovely Quartz Lake while the water color is a murky green it should be a silty blue. The forest service touts this lake as a hiking destination but a herd of 20 cattle live onsite making picnics here less than desirable. As landscape photographers, we all have different visions and reasons to shoot the subject matter we chose. At times, the experience of traveling to these places is as lasting a memory as some of the images that I create. The following is my personal list of western states that I enjoy the most for landscape photography, some interesting statistics, and characteristics that embellish them. Pro’s: Arguably the most scenic mountains in the US accompanied with superior wildflowers, and the most prolific autumn foliage in the Western United States. Diverse topography featuring many southwestern geologic features including sand dunes and red rock. Summer monsoons and early autumn storms make fine art landscape photography possible at almost any time of day. More accessible roads and fewer hiking and camping restrictions than found in most states. Summary: There is no better place in the United States to photograph than Colorado if mountains are your subject matter of choice. Here you’ll find more than 60% of the 14,000 ft. peaks located in the United States. That’s more than twice as the next state Alaska, which is more than six times its size! Addition, Colorado also boasts some of the most dramatic weather in the country, hence the name colorful Colorado. In the summer months, the afternoon skies are littered with clouds during its monsoon season. Fall arrives early in the alpine areas and it is typical to get snow during peak fall foliage. This phenomenon is uncommon or not possible in most other states. Spring brings budding aspens and wildflowers in the foothills of its ranges. 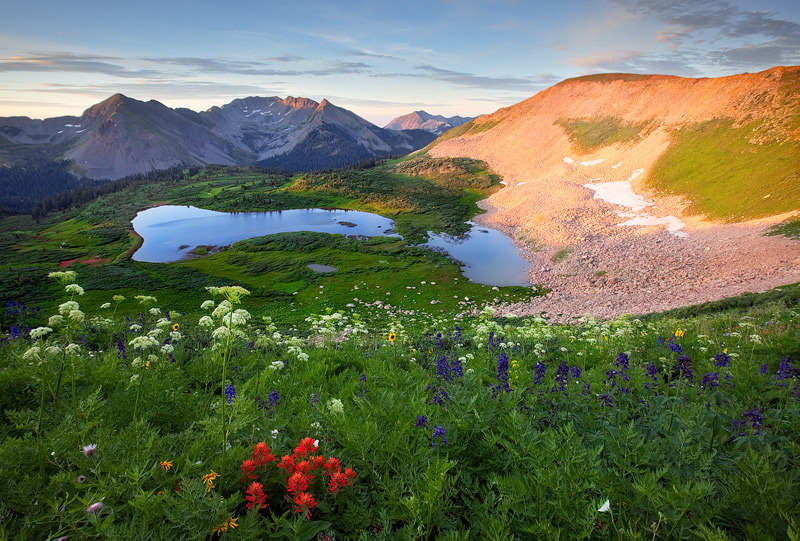 A true four season state, Colorado offers the best of the best for alpine scenery mixed with enough topographical diversity and southwestern reds to make every connoisseur of the landscape a happy camper. Pro’s: The most diverse topography, best alpine lakes, longest coastline, largest island, best sand dunes, tallest mountain, highest waterfall, and most national parks in the country. Summary: The most obvious choice for number one, due to its sheer size and location California finishes a distant second on my list. While the Sierra Nevada’s offer some of the best backpacking in the world, there are too many clear days and way too many bugs to rate it ahead of the mountains in Colorado for landscape photography. Air quality can also be an issue there, as it is in states desert park’s like Death Valley and Joshua Tree. 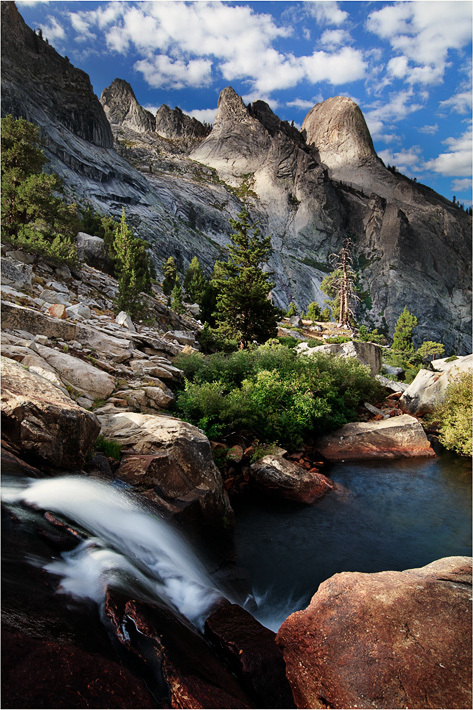 Yosemite and its sister parks King’s Canyon/Sequoia offer big views, lakes, trees, waterfalls and certainly crowds. In the spring, the Mohave Desert is joy to photograph as is the eastern Sierra during all seasons. California’s coastal ranges from Santa Cruz to Santa Monica are arid, homogenous and somewhat uninspiring. However, its beaches offer as much opportunity as anywhere in the country. The Golden State is a place landscape where photographers have to work much harder to get original, high quality landscape shots. Summary: Utah seriously challenges California for the number two position on this list. I gave the nod to California for its diversity and size, but Utah probably offers more bang for the buck and as a whole is arguably a more photogenic state. 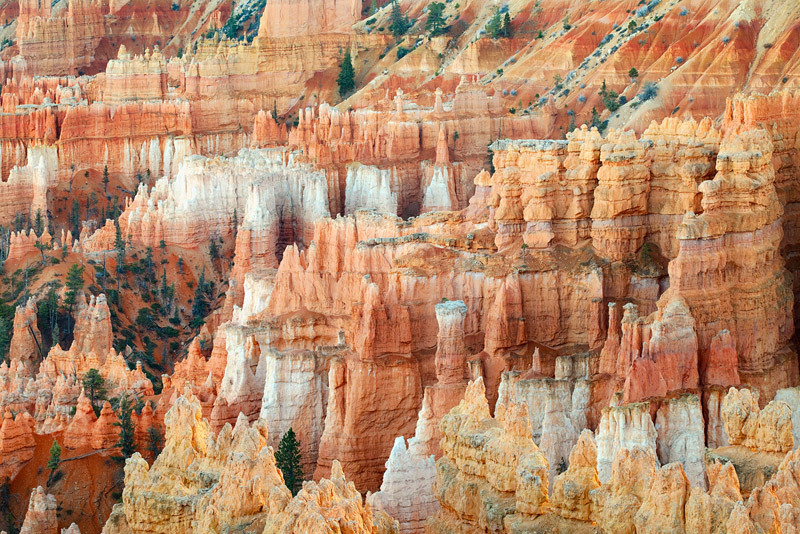 Utah’s most famous scenery comes from the southern part of the state, some of which it shares with Arizona like Monument Valley and the Wave. One also can’t forget the Subway, the Watchman, Mesa Arch, Zebra Canyon, the Narrows, Calf Creek Falls and Delicate Arch as well many others…From its famous national parks to the Wasatch and Uinta Mountains in the north, Utah offers world-class scenery throughout. Its diverse climate and landscape makes it an excellent choice for visitors year round. 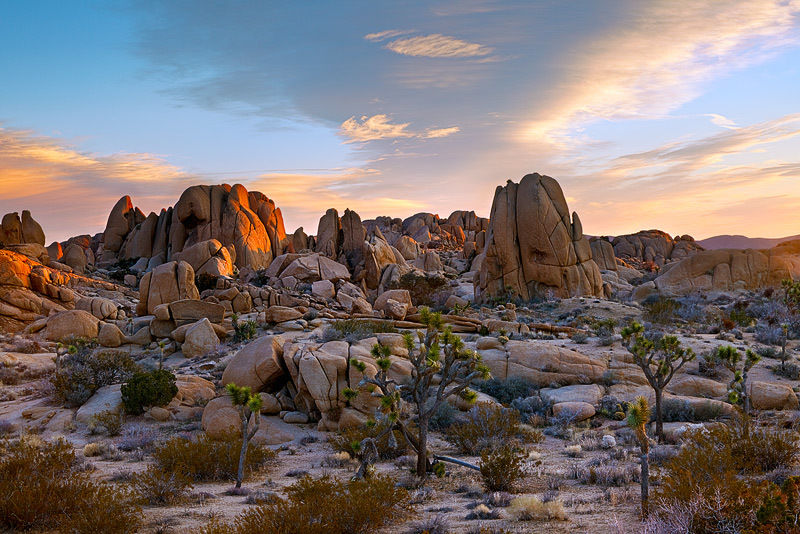 Pro’s: Most iconic southwestern landscapes in the country, easy to find solitude, five national parks, slot canyons, fall foliage, deserts, above average wildflowers and excellent alpine scenery. I’d love to hear some other opinions on this subject whether you agree or disagree. Please feel free to chime in! Today is the first of an exciting new series revealing the technical details, creative thought processes, and other relevant information behind five of my personal favorite images. My goal is to make this series extremely informative – so please come back every day and tell your friends too! Today we’ll start with my newest image from my most recent trip to the Sierra Nevada’s entitled “Land of Enchantment”. Dappled sunlight shows off the morning colors of a high alpine drainage near the Great Western Divide. Creative process: This image was captured during a 6 day/5 night backpacking trip along the High Sierra Trail while camping at Hamilton Lake. Truth be told, I find it very difficult to consistently capture good images when I am backpacking. First off, it is physically and mentally exhausting. Secondly, you are constantly on the move, which leaves little time for location scouting or layover days. Here was my approach to this image: The lakes in the High Sierra normally have tributaries. For many of them, there is water running in on one end and running out on the other. These tributaries tend to be dramatic and this was no exception. Following the creek downstream from our camp, I found this perch after locating the view that captivated me on the way in the day before. I love shooting water if possible. For this image, I used the top of the fall as my foreground element which also opened up the first third of the image. I want to have a clear, unobstructed view of the domes without any distracting foreground elements. The spacing of the trees and bushes work out well here, there is enough to provide interest but not any noticeable overlapping colors, shapes, or patterns. Hopefully this was a big help to you. I will be posting all weekend with more information about some of my best photos!